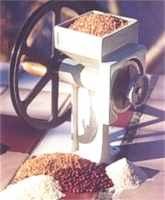 Heavy duty grain mill can be run either manually or by electricity (with attachment). Made of cast aluminum with a chip resistant powder coat finish, the unit has 5 inch carbon steel burrs, sealed bearings, and utilizes a V-belt flywheel. Grind is adjustable from animal feed coarse to fine flower in a single pass. You can even use it to grind peanut butter! There is a 20 year warranty for manual operation.